Originally, the Saharawi were desert nomads who traveled from place to place with their camels. Today, they can be found in the desert in southern Morocco, in the Western Sahara region, in the North of Mauritania, in Algerian refugee camps, and in the Canary Islands. A sub-group of the Moors, they are of mixed Berber, Arab, and black African descent. Some Saharawi are herdsmen, others are traders, and still others are warriors. However, all speak an Arabic dialect called Hassaniya. In addition, their religion, way of life, and dress are Arabic in flavor and style. 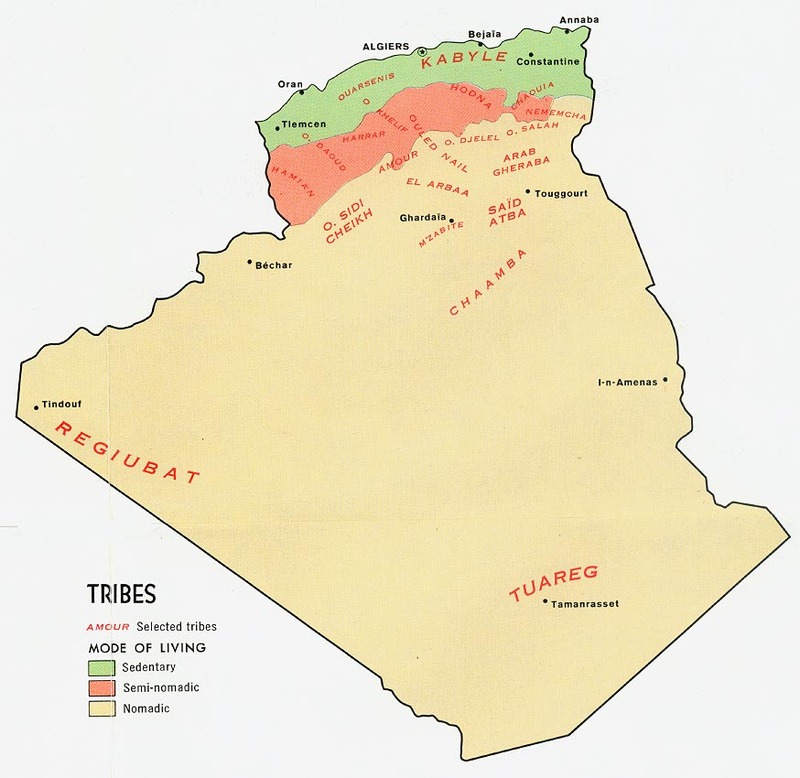 By the 1300s, the Arabs ruled the region, causing conflict with the Berbers until the end of the 1600s. The Saharawi are descendants of these two groups and their slaves. Until 1904 when Spain gained control, the Saharawi were threatened by Morocco's desire to annex the Western Sahara region. Since Spain's withdrawal in 1976, many Saharawi have fled to Algerian refugee camps, returned to the deserts, or joined the Polisario, which continues to demand independence. The many years of the Spanish presence in Morocco greatly affected the nomadic lifestyle of the Saharawi. Current society is varied, with some very wealthy Saharawi, and others very poor, still living in the refugee camps. In Saharawi homes, families sleep on skins covered with blankets. At meal times, the men eat before the women and children. Because of their poverty, most Saharawi generally have only one wife, although their Muslim faith allows them to have up to four. In addition, marriages are endogamous (within the tribe). Agriculture among the Saharawi remains limited, since the average rainfall is only two inches per year. Now that slavery is outlawed, their exports are limited to livestock. There is a long-standing conflict between Morocco and the Saharawi Polisario Front. 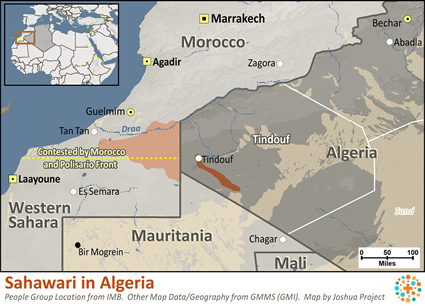 Morocco claims Western Sahara, but Algeria sides with the Polisario, hoping to later negotiate for an outlet to the ocean. Sovereignty in the area currently remains unresolved. As a result of the war, many young Saharawi men have joined the army, dividing the family. Women and children have fled to refugee camps and depend on special programs for basic necessities. Saharawi society consists of four main groups: warriors; marabouts, or holy people; tribute payers, who pay taxes to the higher classes; and black slaves. Craftsmen and musicians form separate, low-caste groups. In the past, differences in social class were clearly marked. The eight Saharawi tribes were constantly at odds with one another, struggling for supremacy. Fighting, robbery, and revenge were the means of surviving drought, plagues, or another robbery. Peace through negotiation always followed. Today, classes serve more as a means of identification rather than a way of life. When the original Berbers were conquered by the Arabs, many fled to the desert, while others were assimilated. All of them, however, accepted the Arab Muslim religion with open hearts. As they embraced their new faith, they carried it with them on their nomadic journeys. Despite their devotion, however, the Berbers retained many of their traditional beliefs. To this day, West African Islam, with its mixture of beliefs, is more tolerant of diversity than Islam elsewhere. While some pre-Islamic beliefs still exist among the Saharawi, they like to think of themselves as pure Muslims. Like most North African groups, there are some beliefs that certain dead Muslim teachers have a power that can be accessed for healing through pilgrimage to their grave sites. Some scholars have mentioned that the Saharawi also worship a god known as Sidi Erbbi, who is paternal and full of life. The Saharawi live in an area of war and political turmoil. As a result, families have been divided, and many have been displaced in refugee camps. Their desire for political recognition and independence is strong. Fervent intercession must be made if the Saharawi are to find lasting peace in a saving relationship with Christ. * Ask the Lord to bring lasting peace in the Western Sahara region of Morocco. * Pray for effective, evangelistic tools to be translated into the Saharawi language. * Ask the Holy Spirit to supernaturally reveal Jesus as the way to true peace. * Ask the Lord to soften the hearts of the Saharawi towards the Gospel message. * Pray that God will save key leaders among the Saharawi who will boldly declare the Lordship of Jesus. 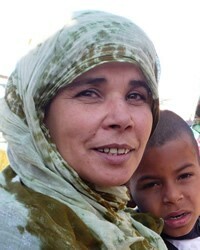 * Pray that strong local churches will be raised up among the Saharawi. * Pray for completion of Bible translation in this people group's primary language.View Saharawi in all countries.